In addition to the easy mounting axial fan, the self-adhesive seal of the mounting frame prevents dust and water from entering the cabinet. The functional design of the intake and exhaust fan hoods very effectively prevents direct infiltration of falling water and dust. 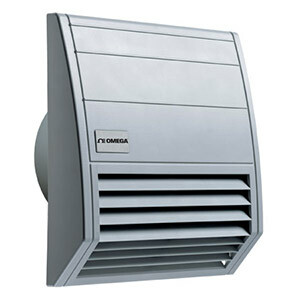 The design also provides air channeling which makes the filter fan particularly quiet in operation. Filter Material: Synthetic fiber with progressive construction, temperature resistant to 100°C (212°F), selfextinguishing class F1; moisture resistant to 100% RH. Can be cleaned by washing or vacuuming for reuse. Standard filter fan, 300 m3/h (176 cfm). It needs exhaust filter. Standard filter fan, 550 m3/h (323 cfm). It needs an exhaust filter. Exhaust filter 350 g/m3, filtering degree 94% for particle Ø<10 m, G4 (EN 779). This item is required for either part number above.